You can see tghe Brickworks in the background as well. They are still thre, I remember when there was still access to the site. It’s worth learning as an extra input to local history. http://maps.nls.uk/view/102344299 gives a more detailed picture of the iron works. 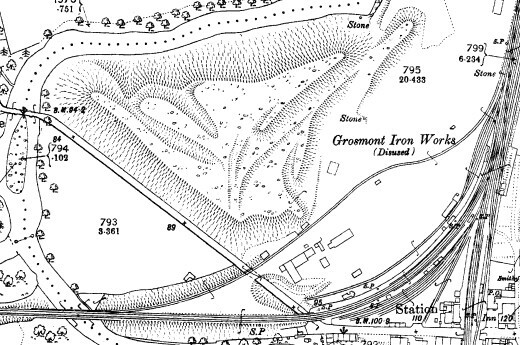 Yes it is a good resource the 1849 Survey shows the blast furnaces and the internal rail lines. By the 1890s survey everything is marked as disused of course including the mine. It’s interesting to see on the oldest map the line of the railway up the incline and the current Goathland Station isn’t yet built of course.